Seven Lighted Tennis Courts, One Lighted Basketball Court, New Exercise Room, Beach Volleyball Court, Two Outdoor Hot Tubs, One Indoor Hot Tub, Steam Room, Sauna, Conference Room, Game Rooms, Beach Store, Movie library, ATM, Outdoor Barbecue Grills. Be careful as not all Plantation condos have access to an indoor or the outdoor heated pool and some condos charge $20 for parking. But YES, , this condo has access to both those pools and we have free parking. ** Conveniently Located Laundry Facilities on each floor. This condo has beautiful Gulf beach view, is fully furnished and well maintained for your comfort. 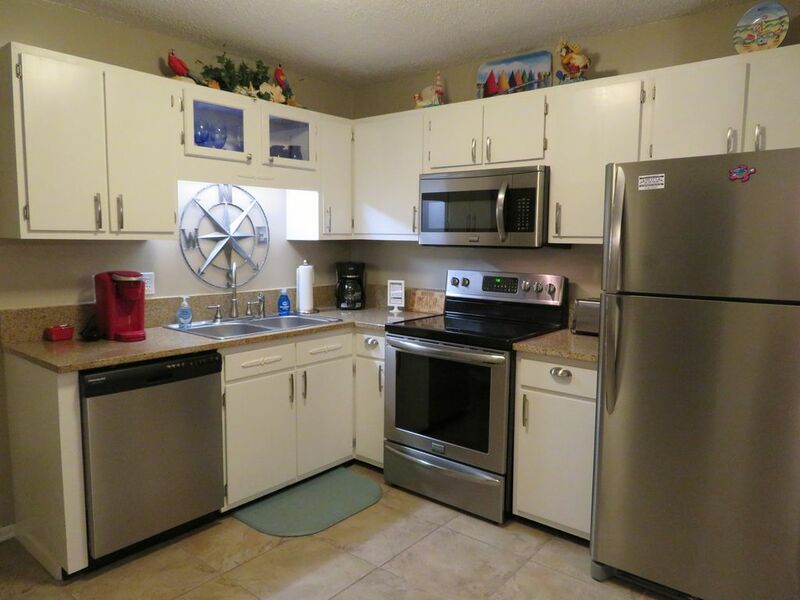 Kitchen is equipped with all new stainless steel appliances to include dishwasher, refrigerator with ice-maker, flat top stove, built in microwave, also blender, coffee maker, and toaster Kitchen has granite countertops. There is a desk area off updated kitchen and we have a new sleeper-sofa with memory foam mattress. Condominium also has three TVs with cable & DVD player, docking station w/music player, Both bedrooms have a queen-size bed and the living room has a sofa sleeper. Linens, iron, and all kitchen utensils provided. Free high speed internet available in the unit. Facility offers a coin-operated laundry on the same floor just steps away. ** This resort is next door to the Nationally-Ranked Kiva Dunes Golf Course and offers numerous on-site amenities. Perfectly situated, the Plantation is minutes away from the restaurants, shopping, and entertainment of Gulf Shores, yet you are away from the over-developed, crowded beaches of the strip. Beaches were always our passion. We couldn't wait to travel to new tropical settings. The tranquility and beauty always puts us in proper perspective of appreciation for the gifts of nature. After the first trip to Gulf Shores Alabama, we knew it was a place we wanted to return again and again. We've love visiting by ourselves, with our family (10 grandchildren) and friends. The beach never disappoints us. After 15 years we've continue to love our southern home, and continually meet new friends and find new activities. The first year after taking an early retirement we bought our first Gulf Shores Condo (Our other 1 bedrm listing is 25459) It's always been a peaceful beach get-away. Away from the normal tourist congestion but with numerous actives a short drive away. It seems like every trip we make, we find new Gulf Shore friends in the complex and new places to explore. We've always enjoyed our beach get-away. The complex has enough amenities so that you can stay at condo, relax and eat-in & find activities on-site. But the local wildlife, restaurants, actives and nightlife offers some wonderful choices worth seeking out. We love the Buffett-sound and the southern-country rock. These musical talents are well showcased in Gulf Shores. Both bathrooms have shower and tubs. Gary and Laura's beach condo was perfect! We could not find one thing wrong with our stay. Not only was the condo beautifully decorated, but it was very well stocked and comfortable. Access to the beach, pools and hot-tubes was very convenient. My family went to the Sassy Bass restaurant that is located right across from the condo and had a delicious meal. We are already planning on our next trip to Fort Morgan and hoping Gary and Laura's condo will be available! Thank you for sharing your slice of heaven with us!! Caron, What a great review...it was so nice to hear from you and we are so glad you enjoyed our beach get-away. Your words are very meaningful and make all our efforts feel worthwhile. Thank you! We look forward to hearing from you again. We had an amazing time! Condo was great, very clean and the complex was lovely. So many fun things to do, the beach is super clean and the food from the food truck was very good! The entire complex is very nice. Our unit was very nice and had a nice view of the ocean. There are two restaurants in the complex which is very convenient. The building is right beside the beach and is easy to access. There are trails and other restaurants within a reasonable distance. We would definitely go back. This place was not tidy and we experienced a lengthy wait for our deposit return. We were greeted with a dirty rag in the sink and a trash can full of used feminine products. Enough said. Indoor pool was not heated, and lack of screens in the windows did not allow us to sleep with them open. All the owner could offer was an apology for the lack of cleanliness. The area was great, just find another place to stay! We believe our condo was VERY clean upon your arrival; Freshly painted, brand new bedspreads, mattress pads and the deep clean was just completed… but we did reschedule all our workers in order to accommodate your request for an earlier arrival date. As such, we were very sorry and embarrassed IF one bathroom trash can was not emptied and a cleaning cloth was left in sink. Unfortunately, this would not have been enough for a refund to your stay. Your deposit is not held by us, is released within 7 days by VRBO automatic system. The property Manager said the indoor pool was 87° during your stay. We are glad you at least that you did seem enjoyed the area. Condo was beautifully decorated with an amazing view and beach access! Our stay was everything we hoped it would be and so much more! It was hard to leave at the end of the week we enjoyed it so much! The condo is perfect for a small family, the pools are gorgeous and well maintained, and the ocean was gorgeous with a lot of space on the beach to spread out! We would love to come back and this condo will be at the top of our list!